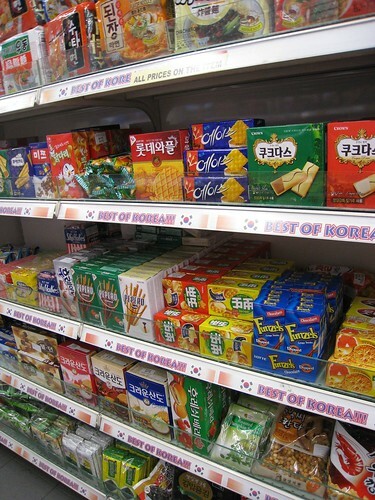 Yesterday I discovered that one of my nearby supermarkets as a special "Best of Korea!!!" aisle. I'm not sure why because there aren't that many Korean expats in the neighbourhood. But the first thing I thought was, "Now I know where to go to practise reading hangeul ..."
However, this morning I inadvertently wound up practising how to read Chinese characters really quickly instead. As part of a pre-trip cultural immersion of sorts, I've borrowed the Korean TV series Woman of the House on DVD, which has Korean and Chinese language tracks, and only Chinese subtitles. I'm definitely not reading the subtitles fast enough to get the full details of the story, but it's amazing how much one can pick up from situational context and body language. I'll be visiting Chuncheon, where Winter Sonata was filmed, so that's next on my must-watch list.